Having originally planned to race the Ironman in Lake Tahoe on this same weekend, my season plan did not include this race (although I did flirt with the idea of trying to do both – deemed insane by my wife). 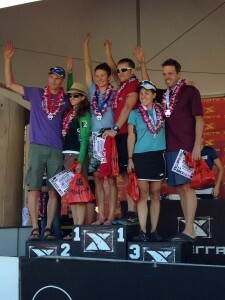 The year started off well with an early victory in a spring XTERRA and then a surprise win of my AG at the XTERRA SE regional champs (which qualified me for Maui). I did another XTERRA here in the ATX area a few weeks afterwards, but did not finish due to a broken rear derailleur. From there I turned my focus to my prep for the Ironman, but tore my calf in the middle of June. The injury prevented me from running at all until the third week of August. With only two races in the books, I was not sure I would qualify for the XTERRA US Champs, and with my injury I felt it may be the only race I could possibly do a month after returning to run. In early August, we made the decision to pull out of the Ironman and after I started to jog lightly half way through that month, I made a bizarre decision. 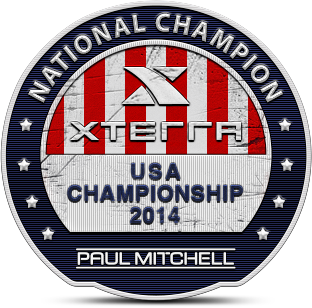 I signed up for the XTERRA Nationals race and booked my flights to Utah on a whim. I had a deadline to keep my slot, and so on the day before it would be lost, I registered and then just hoped that it would not be a waste of money (like Tahoe). As I slowly returned to jogging (very slowly and short distances) over the end of August, I decided to race the Olympic here in ATX on Labor Day. My longest run since the 2nd week of June was 31min at a 9 minute mile pace, and so doing a 10k run off the bike seemed a bit mad, even to me. The positive of that was that I could swim with no pain or issue, ride with no pain or issues, and so if I started the run and had pain, I could just stop and walk home. I figured it would a great test/experiment to see where my swim and bike fitness/speed were, and a chance to see how the calf held up. That race went pretty well, with no issues or pain, but my run pace was very slow (5min slower than the race in May of the same distance and course). 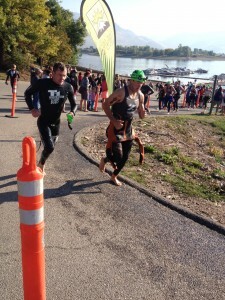 Coming off that race I felt I could definitely get through the XTERRA race in Utah but would not have enough time to slowly build my run fitness and strength to compete for the podium. It was kind of dejavu to last year, where I was in the midst of seeing my Achilles fall apart and had to fake the race in Utah, finishing a dismal 6th. My plan to improve the chances of a decent result was to get to Utah earlier to acclimate more and to ride the bike course a couple extra times to dial in the descents and learn when to really burn matches on the climbs. I knew that running would be where I would give back chunks of time, so the bike became critical. 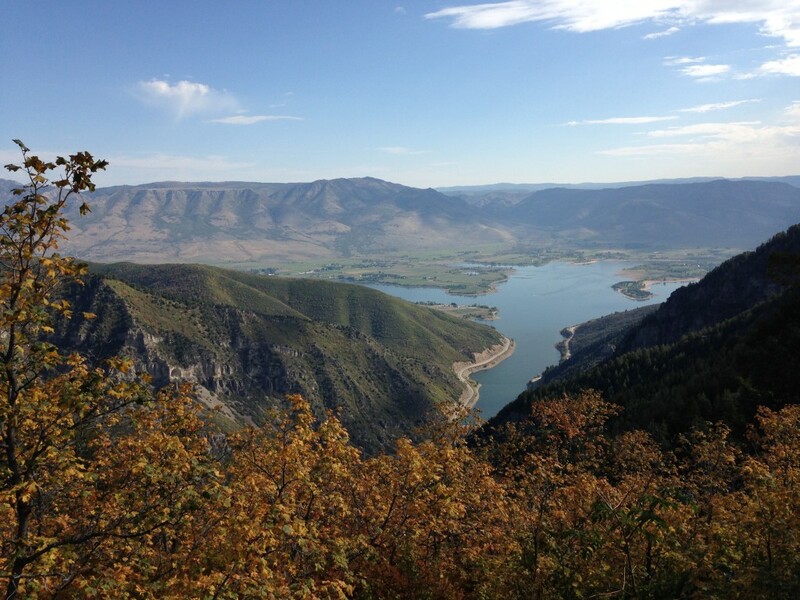 I arrived in Utah seven days before the race and found myself on the mountain or in the reservoir every day leading up the race. On Sunda y, I did a short swim, and then rode the course for the first time (pushing hard on the climbs and taking is slow and easy on the descents, trying to really learn them). After riding, I ran part of the run course to see how the hills would feel on my calf. That was a tough day, but I felt ok and had no issues develop. Monday brought another ride, with less focus on climbing and more on descending faster, along with more swimming. On Tuesday, I ran the full course and swam. On Wednesday, I swam and rode the course (really taking the climbs easy and then drilling the descents to test my limits). On Thursday, I just swam and then did a supposedly easy run in the valley (except I had to run up a really steep hill that I had forgotten all about from prior years). Friday was just a dip in the reservoir and then legs up for much of the day. I got a good massage and myo-fascial release (from Shaun at Mountain Performance Massage) on Wednesday, as well as spent some time in the recovery boots to assist the process. I did not really taper for this race, but did take the last couple days prior to the race progressively easy. On Friday I was feeling good, but not terribly confident. I would be well placed to come off the bike in a good place and a podium spot might be possible. History at Utah did not suggest that was likely. I have always had poor swims there and the longer courses punish slower swimmers more so, and the prior year was disastrous for me in the water. After a short swim warm up, it was a quick race briefing, the national anthem and then boom, the cannon went off. I seeded myself up front and in the center for the start of the two lap 1500m (1800m in actuality it seems) swim. The start was the usual chaos, but I was not knocked about in any really disruptive way. I felt quite good and my exertion level, while high, did not seem to be too much. The first loop went fast after the long first leg of the triangle and on the second loop it was very quiet around me. Towards the very end I came up to a few swimmers and so we all arrived at the boat ramp tightly bunched (not usual for me). My first steps in trying to extricate myself from the water were not good, and I stumbled and grabbed the racer next to me as I went down. It was a frustrating moment, both to lose time, but also to impede another racer slightly. Once actually on my feet, I ran smoothly and through a few people to my transition spot. My transition was fairly smooth except for getting socks on wet feet. That is never quick or easy and I am curious about trying to go sockless in Maui. On the bike, I tried to ride calmly for the first few minutes (and to get my gloves on, another very unpleasant and difficult task). Once fully sorted, I went to work passing people. The first 2 miles are on the gravel edge of the road, and then dropping down on a 180-degree turn, the climb up Wheeler Canyon starts (another 2 miles of fire road to rock garden type climb). I passed loads of people on that climb and felt pretty good. No one came by me and I had my wits about me, and took my first gel at the road crossing before the East Fork climb. On that climb (which is just under 4 miles of steep climbing but more rolling single-track terrain that had a few short descents), I knew that I could recover some on the short descents so I really drilled it up that part of the course. Once I got to the top and began to descend down to Middle Fork, I noticed that I was all by my lonesome. I nearly descended the whole way without seeing a soul, and just came onto 4 riders right at the bottom.I took my time passing those riders (in order to take on some drink and to get myself fully ready for the Sardine Canyon climb). Once past, I only saw about 5 other riders (passed all but one who just stayed out in front of me by 250m or so) on t he switchback climb up Sardine. The top came fairly quickly, but I was suffering a lot and felt I had burned a few too many matches early, since I was not able to close up to the that final rider. Getting over the top and across the off camber traverse was issue free and I kept pushing where the trail tipped up (that was my theme, I pushed hard up and over crests of hills so as to get the immediate free ac celeration on the other side). I flew down the descent from there, really laying it out (and nearly falling off a couple of times). Once on the fire road, I had a bit more nutrition and then pushed as hard as the legs would go up the drag up the reentry into the singletrack just near the edge of the resort. I was really hurting on that part of the course, but did just manage to keep the pressure up and realized there that my placing had to be either really good or that there would be 45 guys who rode just as fast and remained ahead of me. Getting to transition was different this year with the finish line moved. The last few hundred meters were on a slight climb this year and so getting out of my shoes was a big concern. Turns out, the grade is pretty gentle and so my speed was high enough to be able to get my feet out without any problems. I came into transition smoothly (no bike acrobatics this time) and noticed the only bikes in transition were pro bikes (all in a concentrated area), and so I was immediately pumped with adrenaline. I was so pumped I forgot to take off my helmet and only just heard the shouts reminding. I managed to unbuckle it and toss it back in the direction of my spot without stopping my forward progress (and miraculously it slide right onto my towel, as if it knew where to stop). From there I tore out of transition, punched my cousin’s hand and girded myself for what lay ahead. 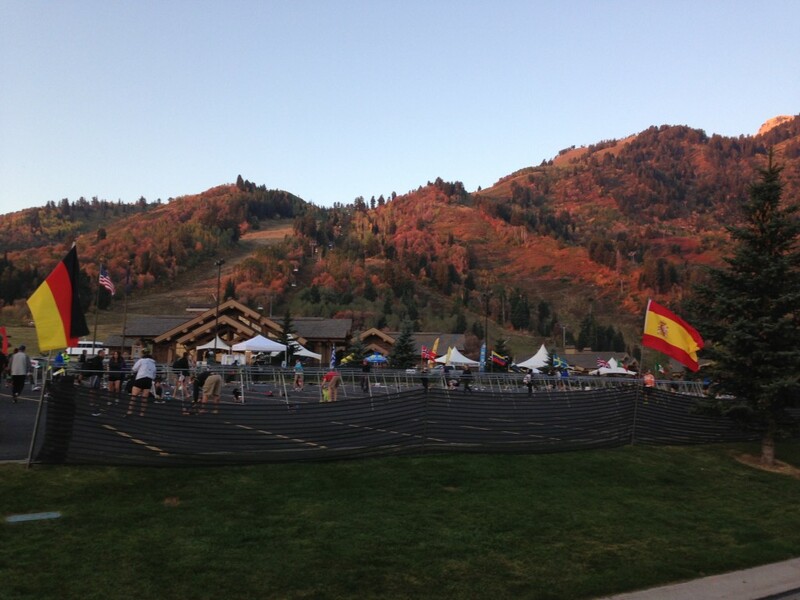 The run course in Utah is a brute (similar to Maui) with lots of climbing, technical rock gardens and steep, loose and rocky descents. The initial hill really hurt and running up it was a gut check, because I could have easily walked, but managed to hold a very slow jog (which was a nice surprise) and once over the last steep pitches and into the rolling singletrack, I began to feel a bit better. On the flat parts I was running faster than I expected (faster than I had seen in months) and was able to manage the hills with descent pace. One problem started to develop and that was stomach cramp. It was not debilitating, but grew to be quite annoying and perhaps limited my pace in the last couple of miles (doubtful since I was physically exhausted by that point). Up to the final mile, not one person had passed me since I left T1, but as is the case occasionally at the end of these races, someone’s footsteps were soon in my ears. It was Emma Gerrard who finished in 4th for the women’s pro race, and she ran downhill with such ease, it was impossible for me to stay with her. She slowly gapped me finished just ahead of me. When I made the last turn to go down the hill to the finish line, I had a moment a pure joy. I knew I had managed the race well and that I had a much better run than I ever could have expected. Once into the athlete tent just beyond the finish line, I took a good look around to see who was there. I only saw pro numbers around me until I noticed two guys who had AG numbers and had a little smile. If that was all that was ahead of me, then it must have been a good day. I did not expect it to be so good. After greeting my family I picked up my results card and saw that I won my division. It was shocking, and left me speechless. My family was ecstatic and hooted and hollered. I could not believe it and did not know what to say or think. I have wanted to win this race since my first visit in 2011, but never did I expect to win this year. Congratulations Jack! Fantastic result, and I love reading your race reports.